The state of New York has a proud legacy as the progressive capital of the nation, and that is more important today than ever before. As New Yorkers, we have fundamentally different philosophies than what Donald Trump laid out in his campaign. So let me be absolutely clear: If anyone feels that they are under attack, I want them to know that the state of New York – the state that has the Statue of Liberty in its harbor – is their refuge. God bless blue states TBH. Oh, I'm happy to see that statement. Guess I'll start practicing on being "straight" now. It's the only thing making me feel better. Since he's a man who lies constantly, of course he lied about what he would do. And since he has no convictions or deep beliefs about anything, that makes it unlikely he'll carry through on anything he said. Ironic: what made him so dangerous in the short term as a candidate may end up saving us from him in the long term as president. Now that Trump won, all the investigations will go away. That was the whole point of the investigations: not to convict Hillary (the Republicans knew there was nothing there to convict her with), but just to cast continual doubt on her with the voters. The one or two congressmen left who are still trying to pursue this are pathetic idiots who don't seem to understand this. Some senior Republican will have to pull them aside and explain it to them. President-elect appears to reiterate his position that an alliance with Syrian and Russian governments to defeat Isis is his preferred way forward in the Syrian conflict. This is amazing news. "Syrian rebels" are Al Qaeda and Al-Nusra among other terrorist groups. I found his position on Middle Eastern policy to be one of his few redeeming qualities. Ah okay. TBH I really do think she's done presidential election wise. I think this election really hurt her deeper than she'd admit. She'll either retire, run for something smaller, or just be a huge surrogate in the future. We shall see. It would be very hard to accept that someone who's way more qualified would lose to someone like Trump. What I don't get is that there is no requirement to have political experience to run for president! Basic jobs require some experience and he has none what so ever in politics! Kate Mckinnon as Hillary opened SNL this week, singing Hallelujah. I cried. Goddamn it, this is still raw, even when I think it's starting to go away. xtina10 wrote: What I don't get is that there is no requirement to have political experience to run for president! That's the purpose of the delegates (representatives) in a republican system of government. They're supposed to be wiser than the GP so they choose the President in behalf of the GP. It's going exactly as i predicted. He is gonna flip on his supporters. They' gon' be maaaaaaaad. It never pays to be uneducated, it makes it so easy to be duped. jorge. wrote: Kate Mckinnon as Hillary opened SNL this week, singing Hallelujah. You should watch Chelsea's post-election episode with Senator Boxer. I wanna see Samantha Bee's reaction to this tbh. SanelyInsane wrote: Has anyone watched the latest episode of Chelsea? Everyone who has Netflix PLEASE WATCH IT. Yes, I was crying with her. I also love hearing Barbra Boxer speak, even though she gets winded. So what are you saying? She could easily win or she doesn't need to run for anything anymore? I'm confused. Should doesn't have to run for anything, but if she wanted to, I think she could win. I would love to see her run as Bernies VP in 2020. She can still be the 1st female VP. Slay a fuckn bit, Trump. Yeah.This gives me a bit of a perspective. I've also watched Chelsea, cried a bit.It's still devastating, even though I am not an American. So what's the plan my fellow liberal sisters? What is your plan to go forward to take action? There are many suggestions, articles out there on what to do. Even if you are not an American citizen you need to understand that we need to do something. Think globally, act locally. Peacefully protested in downtown Portland last night, girls. It was wonderful. kunst wrote: Peacefully protested in downtown Portland last night, girls. It was wonderful. 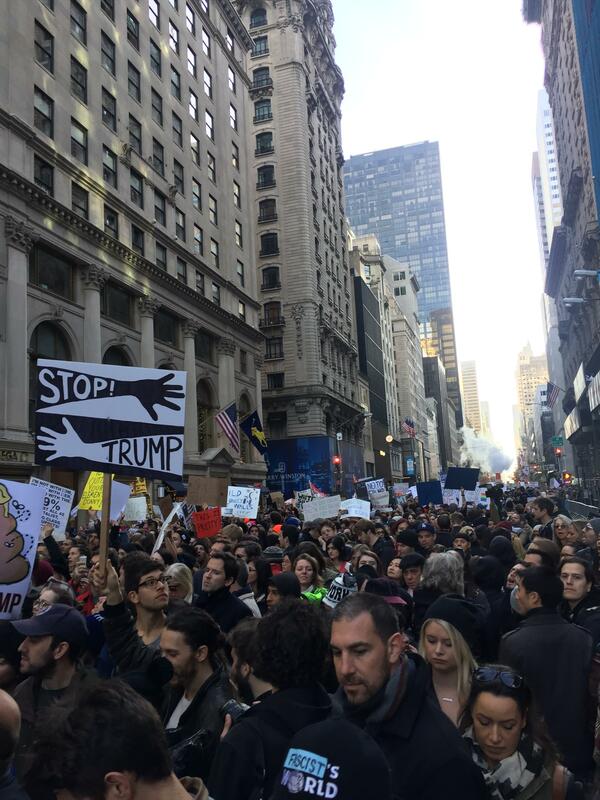 I decided not to go, but about 10 random different friends of mine went to the NYC one outside of Trump tower. They blocked off his block and there's a no fly zone above that area. Not sure if it's still there, but they had dump trucks filled with dirt surrounding the tower. Crazy. I'm like 95% sure I'll be going to the DC protest. Should be historic. I was at the NYC Anti Trump Rally yesterday. Incredible experience. "Spoiled Americans now want to flee what they created"
YAS, waiting for a Change! Keep protesting to get Trump out and y'all will get a bigger surprise if he happens to be impeached. Hell be on 60 minutes tonight. Am eating dinner early so I can catch it.